Wet shores, marshes, sedge meadows, tamarack swamps, peatlands, edges of streams, interdunal swales; moist borders of forests and shallow soil over rock; when occurring in apparently dry places they are often periodically flooded. 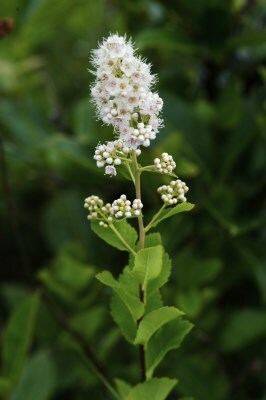 There are two thoroughly intergrading varieties; one of them, primarily eastern in range, is often recognized as a distinct species, S. latifolia (Aiton) Borkh. The more midwestern var. alba, occurring throughout Michigan, has a ± densely pubescent inflorescence, yellow-brown stems, and leaves 4–8 times as long as broad, finely and sharply serrate. In var. latifolia (Aiton) Dippel, the inflorescence is glabrous or nearly so, the stem red- to purple-brown, and the leaves are less than 3 times as long as broad, coarsely and bluntly serrate. The few specimens that appear to be var. latifolia are all from the northeastern Lower Peninsula and the Upper Peninsula. The apparently mostly subalpine and alpine var. septentrionalis (Fernald) F. Seym. (sometimes recognized as S. septentrionalis (Fernald) Á. Löve & D. Löve) has been reported from the Keweenaw Peninsula, but we have not seen the specimen. MICHIGAN FLORA ONLINE. A. A. Reznicek, E. G. Voss, & B. S. Walters. February 2011. University of Michigan. Web. 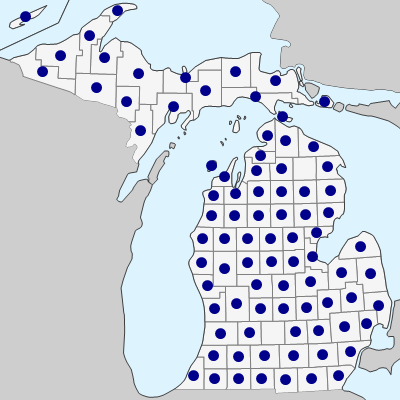 April 19, 2019. https://michiganflora.net/species.aspx?id=2572.